Learn how to make a strawberry swirl cheesecake recipe and its difference from a strawberry marble cheesecake. These two terms “swirl and marble” are very often used interchangeably. I do not see the two as being the same. According to Webster’s Dictionary “marble” is to make appear like marble. If you look at a piece of real marble you will see a blend of colors all the way through. When you make a marble cake, the marble effect must appear through the baked cake. When you learn how to make strawberry swirl cheesecake recipe you will observe and according to the dictionary “swirl” mean a movement in a whirling or twisted pattern. Speaking in cake baking terms this means any movement in the cake showing this type of pattern. A solid strawberry cheesecake would not fit this description. It might be just toward the surface or toward the bottom rather than showing a pattern all through the cake like “marble”. Here is also another difference in my interpretation. If I am making a marble cake I will remove and reserve a portion of the batter. The remaining batter I place in a prepared pan. After coloring or flavoring (or both) the reserved portion, I spoon it on top of the other batter. If the cake is too thick as in tube pans, sometimes it is better to put half of plain batter in the pan, then the colored batter, and then put remaining plain batter on top. Run a knife down through the batter, moving it around to marbleize the batter; careful not to blend too much. You can see an example of marble by taking a look at my key lime cheesecake. 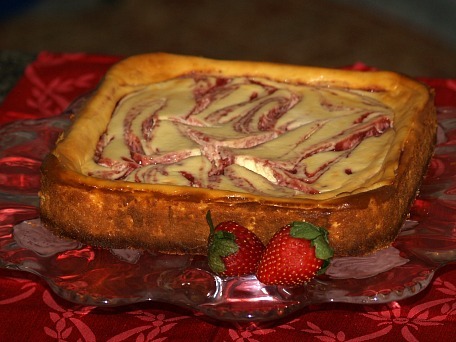 Since I have learned how to make strawberry swirl cheesecake recipe, I do not use the batter to make the swirling effect. Instead I will use more of a sauce to swirl through the batter. The following is a strawberry sauce recipe which was passed on to me and I have used it for many years. It could be used on the bottom of the cake (it will bubble up a little when baked) or it can be spooned on the top and swirled around slightly with a knife before baking. Make this decadent strawberry swirl cheesecake recipe! Crust: Combine cracker crumbs, melted butter and ¼ cup sugar and blend together. Press crumb mixture into bottom of ungreased 9 inch spring form pan; refrigerate for 30 minutes. Sauce: Place berries in processor until smooth; dump in a saucepan. Add sugar, food coloring and ½ cup of sugar and blend. Cook over medium heat while stirring until slightly thickened. MEASURE 1/3 cup for swirling and set aside to cool; cover remaining sauce and refrigerate. Filling: Preheat oven to 325F degrees. Beat cream cheese until light; gradually beat in milk. Add lemon juice and eggs; beat until well combined. Pour half of cream cheese mixture over the crust. 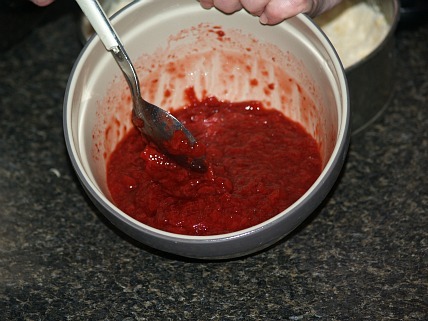 Drop half of strawberry sauce by ½ teaspoonfuls on top. 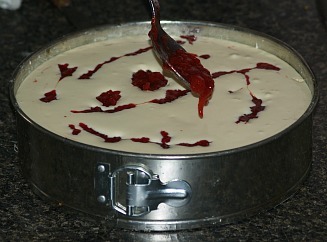 Spoon the remaining cream cheese mixture over the sauce; spoon remaining sauce on top. Cut through the top ONLY with a knife to swirl the sauce. Bake for about 60 minutes until the center is set. Cool on rack 10 minutes; run a knife around edge of pan to loosen and cool 1 hour. Remove sides of pan and serve with remaining strawberry sauce. Not only is this good in a strawberry swirl cheesecake recipe but can be used over ice cream and in other desserts. 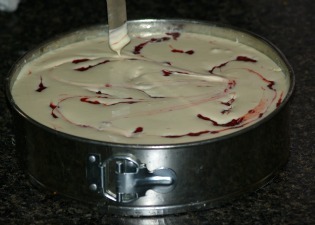 I am using this in one of my individual cheesecake recipes but you can use it on a regular size cheesecake. Adjust amount to what you are making. It is nice to swirl in top a little with a knife. Combine ingredients in heavy saucepan; slowly bring to a boil. Reduce heat to medium and simmer while stirring. Cook until slightly thickened and coats back of spoon, about 15 minutes. Remove from heat, strain in a colander and let set to cool. This is one of the individual cheesecake recipes which is very good. There are several recipes for mini cheesecakes. NOTE: Use sauce in this recipe. These can be baked in regular size muffin tins, large muffin tins, ramekins or molds. After baking run knife around inside of tins and then invert them onto large tray. Lift each with spatula to serving plate and spoon strawberry sauce around it. This may not be a strawberry swirl cheesecake recipe but these cream cheese pie recipes have long been a favorite of (strawberry cheesecake) lovers. Clean berries reserving ½ cup; combine 1 cup of berries and 2/3 cup water and simmer for 3 minutes. Combine sugar, cornstarch and 1/3 cup water; add to boiling mixture and boil 1 minute, then cool. 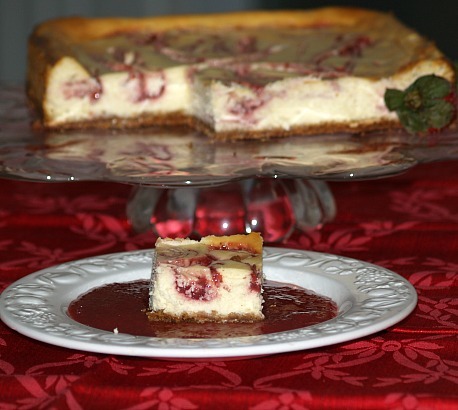 Spread softened cream cheese over baked pie crust; top with cooked strawberry mixture. Top with whipped cream and reserved ½ cup berries. Beat cream cheese, sugar and almond until smooth and creamy. Fold in whipped cream until blended; spread in pie crust. Top cheese mixture with pie filling; refrigerate for at least 5 hours. TO MAKE CRUST combine crumbs, sugar and butter. Mix well and press on bottom of 9 inch spring form pan. TO MAKE FILLING beat cheese until fluffy in a large bowl. Gradually beat in the canned milk until smooth. Add the eggs and lemon juice; mix well. Pour HALF of filling into prepared pan. Combine remaining 1 teaspoon lemon juice with strawberry preserves. Drop strawberry mixture by small spoonfuls over batter. Top with remaining batter; bake for 50 to 55 minutes until center is set. Cool on rack to room temperature; refrigerate overnight. Just before serving remove sides of pan; serves 10 to 12.